UNDER the 2013 constitution a completely new layer of governance has been placed between local and national government with the people who will run this new tier having been elected in the harmonised election. It would be some time before all members of the new provincial and metropolitan councils are known. And it would take even longer before the full powers, their staffing and terms and conditions of service of the members are known. All these matters require an Act of Parliament to settle. And as all 270 members of the National Assembly, including the special women members elected on proportional representation, and 78 of the 80 senators, would be members of one provincial or metropolitan council, the debate in Parliament on the new Act could be intense. The only two members of the new Parliament who would not sit on a provincial or metropolitcan council are the two senators representing people living with disabilities. The new constitution abolished the office of provincial governors, who were presidential appointments, and thus part of the national Government, although they sat with an advisory council made up of the chairmen of the urban and rural councils in their provinces. In their place as the ‘face’ of a province would come the chairmen of the provincial and metropolitan councils, who would be elected and whose councils would be far more high-powered. The constitution introduced, in its preamble to the sections on local government, the principle of subsidiariness. This means that Government functions that could be moved down to lower tiers should be moved down. At the same time, the preamble states that national unity must be preserved, and that disuniting processes must be resisted. By having the majority of provincial council members sit in both the provincial councils and Parliament, the drafters seem to have tried to make sure that council members have both local and national perspectives. For the first time the metropolitan provinces of Harare and Bulawayo would have a provincial structure, although this would be different in several ways from the structure of the eight non-metropolitan provinces. At the beginning, the provinces would be the inherited 10, and their component districts would be those now existing. But an Act of Parliament may set out a process to change boundaries, so long as this process allows for consultation with affected communities. 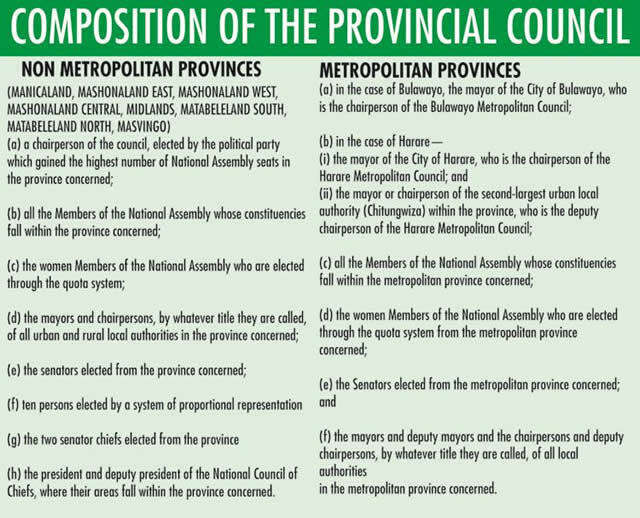 The eight provincial and two metropolitan councils have broad functions sketched in the constitution. They have responsibility for the social and economic development of the province, including: planning and implementing social and economic development activities, co-ordinating and implementing governmental programmes, planning and implementing measures for the conservation, improvement and management of natural resources, promoting tourism and developing facilities for that purpose, monitoring and evaluating the use of resources. The two councils are also charged with “exercising any other functions, including legislative functions, that may be conferred or imposed on it by or under an Act of Parliament”. That last function allows the national Parliament a great deal of flexibility. 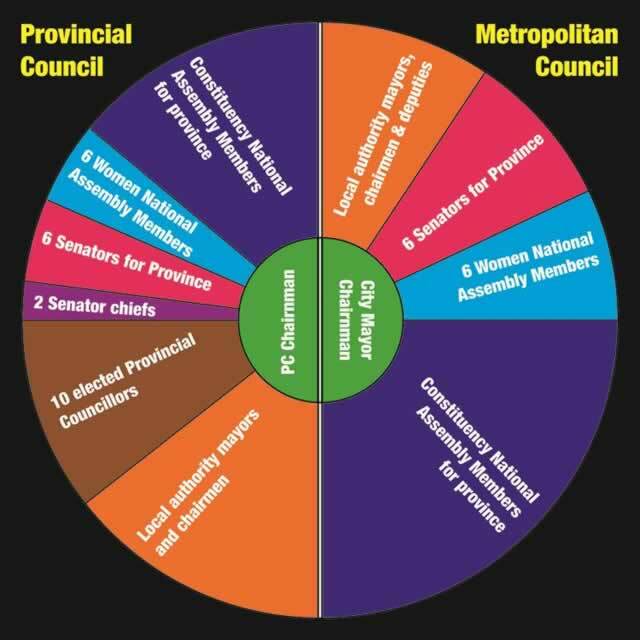 Each of the eight provincial councils are made up of all members of the National Assembly with a constituency in the province, the six women National Assembly members elected from the province as a whole through proportional representation, the six senators from the province, the two chiefs from the province plus the president or vice president of the council of chiefs, who also sit in the Senate, if they come from that province. This group of national legislators is rounded off with the 10 provincial council members elected last week for each non-metropolitan province through a party-list system linked to the National Assembly election, and the mayor or chairman of every urban or rural council in the province. While the Parliamentarian members and the 10 extra councillors are known, the chairmen of the local councils would only be known once they have sat and have elected their mayor or chairman. The chairman of a provincial council is elected by the full council. But the party that obtained the most National Assembly seats in that province nominates at least two ‘qualified’ candidates, from which the full council chooses one. Should two parties tie for the same top number of seats, then the one with the most votes provide the candidates. Zanu-PF would thus be the nominating party for the first chairman of all eight provincial councils. The two metropolitan councils have a slightly different make-up. One again all members of the National Assembly from that province, plus the six women members, plus the six senators are members of the metropolitan council. They are joined by the mayor and deputy mayor, or the chairman and deputy chairman, of any local authority within that province. There are no extra councillors and obviously no senator chiefs in such councils. The chairpersons of the Bulawayo or Harare Metropolitan Councils would become mayors of the two cities respectively, with the chairperson of the next largest council in Harare province, presumably at the moment the mayor of Chitungwiza, as the deputy chairperson. But an Act of Parliament has to lay down how these two mayors are chosen; an existing Act does this and can be amended in the ordinary way. In both cities the MDC-T has a majority of councillors and thus that party would presumably elect the mayor, who does not have to be a city councillor, and who would then by virtue of office be the chairman of the metropolitan council. The smallest of the new provincial councils would be the Bulawayo Metropolitan Council, with just 26 members, while the largest appears to be the Midlands Provincial Council with more than 62 members. Besides being a big province, Midlands has a large number of cities and towns. More than 500 people would sit on the 10 councils.